While studying art at Black Mountain College, North Carolina, Noland was exposed to the work of the European De Stijl movement and, from Josef Albers, he absorbed the art theories propounded before WWII at the Bauhaus in Germany. Allied with a number of American painters who were engaged in developing a visual vocabulary appropriate to an indigenous abstract style, Noland was a pioneer in the development of Color Field painting. His shaped canvases, at first symmetrical and asymmetrical diamonds, and then completely irregular in shape, were critically understood as works in which the edge was a significant component of the painting itself. To distance the painter from the abstract geometry of the edges and surface of his pictures, Noland detached himself by eliminating brush strokes through staining his canvases with their colors. 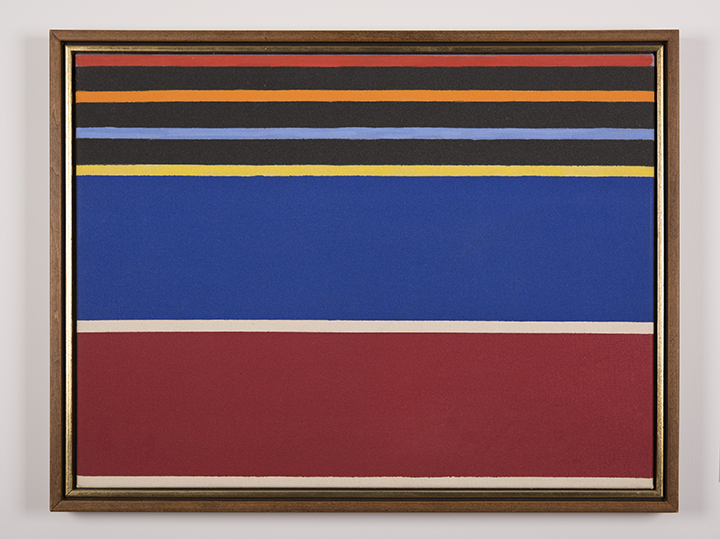 Silent Adios I (1969) is a good example of this practice: the bold horizontal bands meet one another in a very subtle bleed edge, which causes the colors to vibrate against each other.